Kentucky state laws require that dogs must remain under the care and control of owners and not be left to roam. This is enforced in every county, and dogs that are left to roam unattended may be taken in by animal control. Dog owners may ensure their own compliance and invest in the safe keeping of their much-loved pets by using an electric dog fence. KY canine guardians who buy underground fencing from Dog Guard can remain in compliance with applicable legislation while letting their furry friends enjoy romping and playing within the confines of property lines enclosed by an electric fence. KY dog owners training and raising a canine friend surely will enjoy the security and simplicity that this out-of-sight fence affords. Why Purchase a Wireless Dog Fence? There are many reasons for area dog owners to obtain a hidden fence. KY wireless pet containment systems are an efficient strategy for containment that is not as costly as installing a typical fence. Canines allowed to roam freely may wander and become a nuisance to the neighborhood or get hit by a motor vehicle. Using a wireless fencing strategy can also be a means for making an above-ground fence more effective. Traditional fences are often subject to digging and climbing, making then ineffective compared to an electric fence. Kentucky dog owners can use an underground dog fence to prevent any digging and climbing. Additionally, an underground fencing option can also create boundaries within the yard to ensure that pools and flower beds are off limits to the family dog. An underground fencing option can be quite effective for containment. Effectiveness levels can be increased by owners who ensure that the containment system continues to work properly and that lights on the transmitter are functioning correctly. The dog must also have consistent training to recognize fence boundaries, and at Dog Guard, we can help get you started with this. Of course, each canine is different, so training time may vary. A dog with a heavy fur coat might be more difficult to train if the collar area isn’t cut short because thick fur can make it difficult for the receiver to get the correction transmission. A power outage may also be a major point of concern: It could be helpful to use a battery backup to maintain power should an outage occur. It’s not difficult to understand how an electric dog fence works. The boundary areas of the Dog Guard fence are outlined with flags to give your pet a visible frame of reference. Canine guardians should dedicate as much as 20 minutes a day, twice daily, to exercising the pet within the boundaries. When the pet moves toward a flag, the owner should correct the dog and lead the dog away while lavishing praise on the canine. This strategy helps the animal remember where the boundaries are in the most efficient manner. Once these limits are learned, the flags can be removed. Praise and repetition are essential for success in using this type of containment. The correction employed with a Dog Guard dog containment system has been evaluated and tested by vets. The slight pulse is harmless to dogs and is akin to static shock. It doesn’t cause pain, but this sensation is not welcome. This unpleasant sensation is designed to encourage avoidance behavior. The premise behind installing this type of fencing option is to prevent the canine from wandering without having to provide constant corrections. Training efforts are combined with correction from the system to ensure that the dog avoids the boundaries. In most cases, dogs only sustain a few corrections, but corrections must be stronger than any possible distractions that canines experience in order for the containment system to work effectively. 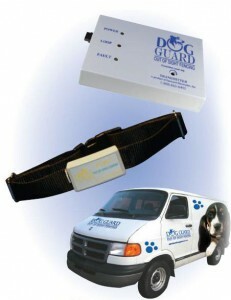 Clearly, one of the most effective methods to provide protection for beloved canines is to use a Dog Guard wireless pet fence. Kentucky canine guardians will be appreciative when they realize that this method of containment is easy to use and that only a small amount of patience and time is needed during the initial setup of the pet fence in addition to acclimating the dog to the fence perimeter. Of course, this is a small investment considering the happiness and freedom that the beloved canine experiences while exercising and roaming without a care, safe within the confines of their home territory.